A vehicle’s chassis is the main structures of the vehicle, where all other components are assembled to the frame. Each vehicle’s attribute were being designed to satisfy the requirements of a desired group of end users. Being the most out of street vehicles, normal passenger cars were being formed for a few common goals and comfort is one of them. In order to achieve this, a set of street use suspension and soft spring rate will be fitted. While maintaining the level of comfort, the vehicle would be sacrificing its ride handling. The vehicle tends to increase in body roll especially during emergency stops which contribute more forces to the front, resulting in poor steering response, stopping power and even result in accidents. If you’re serious about your car’s handling performance, you will first be looking at lowering the suspension. In most cases, unless you’re a complete gear head, this will be more than adequate. However, if you are a keen driver, you will be able to get far better handling out of your car by fitting a couple of other accessories to it. The first thing you should look at is a strut brace. A strut brace bolts across the top of the engine to the tops of the two suspension posts and makes that direct physical contact. The result is that the whole front suspension setup becomes a lot more rigid and there will be virtually no movement relative to each side. In effect, you’re adding the fourth side to the open box created by the sub-frame and the two suspension pillars. 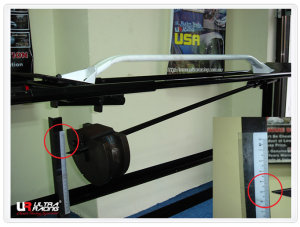 The chassis of the car is the part which experiences the most of the abuse from the driver. It is particularly due to the weight transfer of the vehicle body during fast cornering, hard braking or hard acceleration. In some instances, the weight transfer during cornering may cause one side of the vehicle to experience as much as 3 times more force than the other side of the vehicle, causing enormous chassis flex/ vehicle body deformity and twist, consequently causing tires to lose grip. Deformity and twisting of the vehicle chassis during cornering may cause negative handling traits such as under-steering and over-steering. The front wheels are likely to slip towards outside of the turn angle, driver can solve it by turning a little more slightly but the handling is reduced, vehicle’s behavior is less predictable and tires are likely to worn out faster. Under-steer often occurs in front wheel drive layout vehicles. As most modern cars go, car manufacturers employ the FF (Front engine, Front wheel drive) setup for improving driver and passenger safety. The natural behavior of an FF car is to have a slight understeer, due to its heavier front end. Understeer happens when the front wheels lose their traction and won’t turn any sharper, even when the steering is being corrected to turn the car more. This will cause the car to go wide instead of following the line. 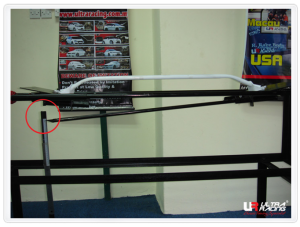 Understeer can be corrected by stiffening the rear end of the vehicle by adding a Rear Strut Bar and a Rear Anti Roll Bar. Oversteer is when the rear tires lose grip and causing the rear end of the vehicle slides out of a corner. This phenomenon happens particularly to FR (Front engine, Rear wheel drive) or RR (Rear engine, Rear wheel drive) cars. Oversteer can be corrected by stiffening the front end of the vehicle by adding Front Strut Bars and Front Anti Roll Bars. 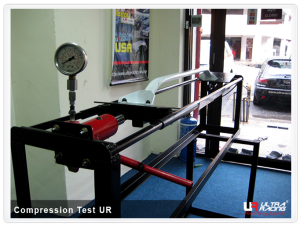 In order to reach the desired performance of Ultra Racing products, we constantly monitor the quality of our bracing, not only during the production stage, but also conduct strict performance testing afterwards. 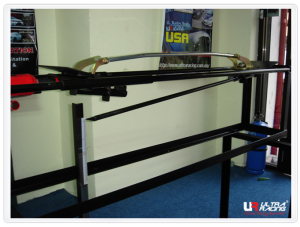 During the development phase of Ultra Racing bars, we ensure the products are in accordance to our design and development philosophy. 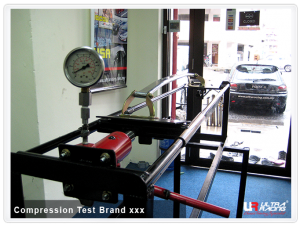 We conduct real on-road performance test as well as on-track testing. 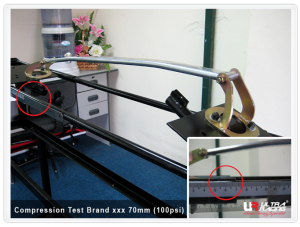 In order to obtain data, we also invented three testing jigs, namely Bending Test Jig, Torsion Test and Flex Test Jig. 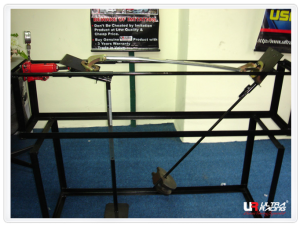 These jigs are used to test the performance of our products on a continuous basis. 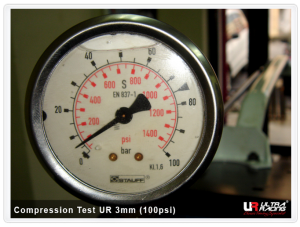 To achieve safe condition, the displacement must be less than the thickness of the material which is below 2mm. Therefore, the bar is in SAFE condition. First, steel is stronger than aluminum for the same size and thickness. In order for aluminum alloys to be at least the same strength as steel, it has to be at least double the thickness (Steel 4MM = Aluminum 8MM). When that happens, weight saving is not so apparent anymore. Of course there are also exotic materials and alloys that can match the strengths of steel, but the cost are astronomically high and therefore not very cost effective to bring into mass production.